On 5th September 1986 a number of small, pale theridiids were collected from moist litter on Hankley Common, Surrey. The spiders were tubed individually and, during the journey home, they all made small webs of a type which I had not seen in the field or described in the literature. Several of them matured within the next few days, so that they could be identified as Pholcomma gibbum. When found, all the spiders including sub-adult males, had the carapace and legs pale yellow, and the abdomen marked with brown spots. On maturing, the males developed scuta, and a more deeply reddish-brown colouration. The web of Pholcomma gibbum is similar to, but distinct from, those of other small British theridiids (e.g. Dipoena, Crustulina), which make webs in the form of Steatoda species, with relatively large, irregular sheets, from which lines extend above, below, and to the sides. These are viscid at their extremities. Subsequent captures of these species in 1987 and 1988 from other sites confirmed the web structure which is described here. I would be interested to know what form the web of the similarly sized Theonoe minutissima takes: I have never seen this species. The spiders were housed in plastic boxes 65 mm in diameter, 15 mm high, with a thin soil layer on the base and pieces of dry plants (leaves, twigs) positioned with spaces below them for the spiders to build their webs. The overall diameter of four webs averaged about 20 mm. When seen from above, the web looks like a half-finished orb web and, indeed, one web had the majority of the lines in the horizontal plane; but the placing of these radiating strands probably depends on the available fixing points. The retreat resembles the hub of an orb web, with a coarsely woven mesh; its diameter is about twice the length of the spider. In one web, 26 lines were counted which radiated to various points in the surrounding vegetation and substrate. Other webs appeared to have similar numbers of 'radii'. The lines are viscid for almost all of their length, but the droplets are largest in the apical third. In time, a low circumferential wall is developed around the retreat, but it does not increase in diameter. Steatoda species make their webs larger and more elaborate with the passage of time, and with the addition of 'fluffy' patches which give the impression of cribellate silk. Neither of these features were seen in the Pholcomma webs. Prey items, consisting of psocids (Psocoptera: Liposcelis terrestris) were dropped onto the lines or, when this failed, were allowed to wander about on the substrate. Ultimately they encountered the base of one of the lines and become stuck to the viscid foot. 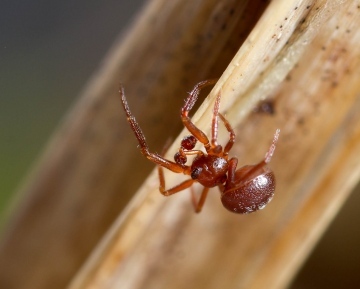 As their struggles became more pronounced, the line broke near its base and lifted them off the substrate (a typical feature of webs made by Steatoda). On one occasion, the tension in the line was sufficient to catapult the psocid straight into the jaws of the waiting spider, which lightly wrapped it before feeding. More usually, the struggles of the prey alerted the spider which ran along the lines to capture it. One prey item was bitten on the line and taken back to the retreat before being wrapped. Presumably if larger prey is encountered, it is wrapped before transporting to the retreat, as is the case with other web-makers. Attempts to mate spiders on two occasions were unsuccessful â€” the female dropped from her web and allowed the male to occupy it. After a few hours the male was found to have built his own web some distance away from the female's, which she had then regained. Although the spiders are usually found in damp habitats at ground level, they were able to survive well in dry containers for several months over the winter. One female survived from Christmas to the end of April (16 weeks) without food or water in a sealed box in a cold room. This suggests that, in spite of their normal habitat, they are water-proof rather than water-dependent. Their web sites are possibly governed by the web form or suitable prey which occurs at ground level. I infer from the fact that I have found several on fences in various sites during the autumn and mid-winter, that they can disperse by air.